Cheap and abundant refrigerant, highly reliable: Air is used as refrigerant, which is easily available and inexpensive. Charging of refrigerant is very easy. The cold air can be directly used for refrigeration; it is useful in aircraft refrigeration at high altitude. There would be no significant change in the performance of air refrigeration if it is operated much away from its design conditions. It can produce very high temperature differences between hot and cold region. So the same system can be used for both cooling and heating effects. It also helps to achieve very low temperature. Air refrigeration is used in aircraft due to availability cold air at high altitude and it can can achieve both air-conditioning, as well as the pressurization of the cabin. Lower C.O.P. compared to other refrigeration cycle. The mass of air required to circulate in the system is very high when compared to other type of refrigeration cycle due to low specific heat capacity. 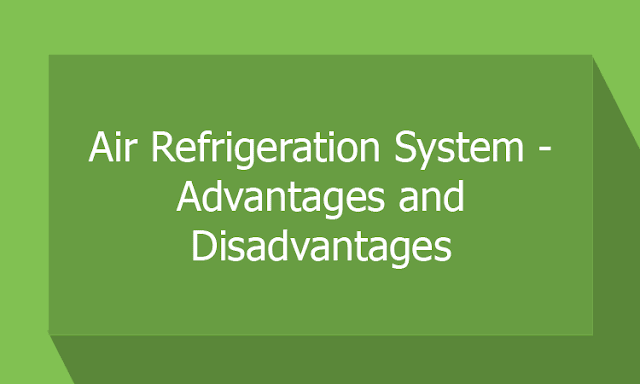 System components are bulky, large space per ton of refrigeration. The chance of frosting at expander is more due to moisture content in the air. Air contains pollutant particle, so do regular cleaning of air filter in open system.